PLACING ORDERS: SHIPPING VS. PICKUP? For those living in Greeley, or the surrounding area, it is not necessary to click the shipping option when ordering. If desired, you can choose the option to PICKUP the book. After placing the order, call the number on this page to schedule a pickup time. DO NOT show up without scheduling. SHIPPING orders take 3 days once FedEx Express has processed the package. The screen shot below shows where you can choose shipping or pickup when in your cart. CAN I PAY BY CHECK INSTEAD OF ORDERING ONLINE? If your browser is outdated, or if you don't want to order online, you can pay by check. Total cost is $56.94 per book (which includes shipping). If shipping is not needed, total cost is $49.95. Make checks payable to 14er Canine LLC. TEMPORARY CHECKS ARE NOT ACCEPTED. Mail checks to the address listed above. BOOK REVIEWS: WHERE CAN I READ OR WRITE THEM? 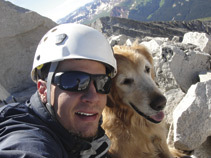 There are currently two locations online that allow you to read or write book reviews about Climbing Colorado's 14ers With Sawyer. To read reviews, click on the Google Books or Goodreads links below. To write a review, see the options below. 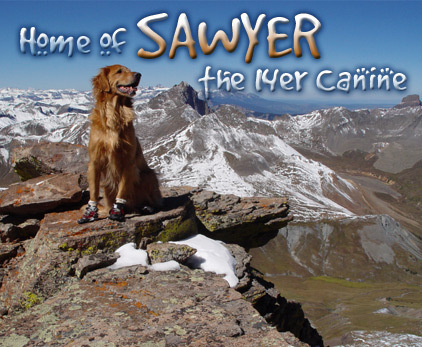 Option 1: Go to Google Books: Climbing Colorado's 14ers With Sawyer and click on Write a review (in the middle of the page). You will be prompted to sign into your email to write a review. When signed in, click the star rating (1-5) just above the text box, and then type your review into the box. Hit the SAVE button below the box when you are done. Option 2: Go to Goodreads: Climbing Colorado's 14ers With Sawyer and hover over the star ratings just below the small cover image of the book. It should say Rate this book in gray text. The stars will begin turn yellow as you hover over them. Click and you will be prompted to sign into your Goodreads account if you have one. If not, you can sign in via Facebook, Twitter, Google, or Amazon to write a review. When signed in, click the star rating (1-5) and then type your review.